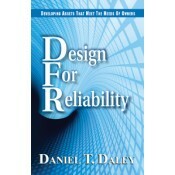 None of the few Design for Reliability (DFR) books currently available addresses the process from the owner’s (or buyer’s) perspective. Instead, they approach DFR strictly from the seller’s (or manufacturer’s) viewpoint. As a result, few assets are designed and developed with the intent to meet the future owner’s specific needs for reliability, availability, and maintainability over the life of the asset. In this groundbreaking new book, Dan Daley intends to correct the imbalance in how DFR is often implemented by providing owners with the tools they need to ensure that their requirements - not the seller’s - are followed in developing new assets. This book will be an invaluable guide to everyone involved in the design, development, or purchase of new assets. It will help owners take the necessary steps to get what they really need, and it will help sellers “deliver the goods” that their customers – the owners – actually want. • Explains how to properly integrate DFR activities with conventional design activities. • Provides a simple system to ensure DFR activities are completed on time. • Provides spreadsheets and forms needed to portray design results in a clear and usable format. • Includes the tables and forms needed to support the design processes and procedures presented in each chapter. • Includes appendices that provide an example specification that owners can modify when procuring a new asset and example tables useful in assessing how well the DFR process has met the owner’s needs.